A third quarter technical foul charged against Giannis Antetokounmpo ignited a Milwaukee Bucks run and they went on to beat the Indiana Pacers 117-98 on Thursday night at Fiserv Forum. Antetokounmpo finished with 29 points and 12 rebounds, while Khris Middleton rebounded from a poor shooting game at Phoenix with 27 points to lead the Bucks. After Antetokounmpo thought he was fouled and got hit with a technical, the Bucks went on a 13-0 run to widen the gap and the Bucks would never be challenged again. The victory ended a two-game losing skid and helped the Bucks improve to 3-1 against the Pacers, who own the 3rd best record in the Eastern Conference. The Bucks also improved to 9-3 against the four teams directly behind them in the Eastern Conference. The Bucks return home Saturday night to host Charlotte at Fiserv Forum. Another big night for all-star Giannis Antetokounmpo on Wednesday night. Giannis tallied his 5th triple-double of the season with 33 points, 19 rebounds and 11 assists to lead the Milwaukee Bucks to a 106-97 win over the Indiana Pacers. The Bucks trailed by 10 points in the fourth quarter, then went on a 11-0 run on the way to the 9-point win. The Bucks won for the 14th time in the last 16 games and improved to a league best 43-14. The Bucks head into the all-star break one win short of their entire win total from last season and still have 25 games left to play. Malcolm Brogdon added 17 points and Khris Middleton 15 to help the Bucks. The Bucks went big down the stretch and went to a switch everything defense and it worked. They had been stuck in an offensive rut and coach Mike Budenholzer was simply looking for anything that might work. The Pacers saw their six game winning streak come to an end. Ersan Ilyasova missed just two shots, connected on five 3-pointers, and scored a career-high 34 points as the Milwaukee Bucks held off a second half charge by the Indiana Pacers to win the Central Division battle, 111-107, at the BMO Harris Bradley Center. Milwaukee built a 23-point first quarter lead as they began the game on a 34-11 run. During that stretch, the Bucks made 14-of-19 shots, including eight straight, as they won for the second consecutive game. It’s only the fifth win in the past 18 outings. 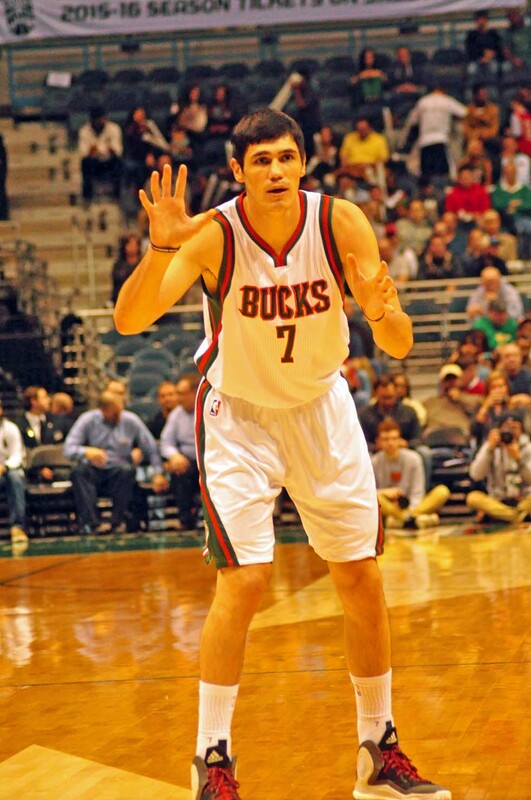 All five Bucks scored in double-figured, led by Ilyasova. Khris Middleton had 17 points, followed by Giannis Antetokounmpo’s 16. As a team, Milwaukee outshot Indiana 53-percent to 42-percent. The Pacers rallied back to within two in the final 20-seconds and trailed 110-107 when George Hill’s attempt to tie the game rattled out of the basket with less than two seconds remaining. Hill (24) and backcourt mate C.J. Miles (26) combined for 50 points. Despite a double-double from Larry Sanders, the Milwaukee Bucks were defeated by the Indiana Pacers 95-80 on Saturday night. On a weekend that saw back-to-back games played by Milwaukee, the Bucks struggled shooting from the floor, hitting just under 38% of their shots. This fourth consecutive loss from Milwaukee puts them at 16-16 and now three and one half games behind Central Division leaders the Pacers. For Milwaukee, Monta Ellis had a game-high 21 points and was one of three Bucks in double-digits. Larry Sanders and Brandon Jennings each had 12 points in the loss. Sanders led the team in rebounds with 12, and got his-double-double for the game. Indiana was led in scoring by Roy Hibbert, who also had a double-double and scored 20 points. Pacers’ George Hill had 14 points, and David West and Lance Stephenson each had 10 points in the victory. The Pacers were led in rebounds by Hibbert who had 15, with Hill grabbing eight boards. Milwaukee looks to snap this losing streak at home against the Phoenix Suns Tuesday night. While the Milwaukee Bucks (16-15) created a 58-47 lead at halftime, they could not maintain that lead Saturday night against the Houston Rockets (19-14). A combination of poor shooting in the third quarter from Milwaukee plus a 38 point fourth quarter from Houston fueled the comeback and saw Milwaukee drop their third game in a row. The Bucks went 4 of 16 for shooting in the third quarter and, in the fourth quarter, allowed a 13-0 run from Houston. With this third consecutive loss, Milwaukee drops to third in the Central Division, two games behind the Chicago Bulls and the Indiana Pacers who are tied for the lead. Brandon Jennings was one of seven Milwaukee Bucks who hit the double-digit mark in scoring, with 16 points. Accompanying him was Monta Ellis and Mike Dunleavy with 12 points, John Henson, Ersan Ilyasova, and Beno Udrih all with 11 points, and Ekoe Udoh with 10 points. The Bucks were led in rebounds by John Henson with 15 rebounds en route to his double-double. Ekoe Udoh of the Bucks had eight rebounds on the night. Houston was led in scoring by James Harden with 29 points. Carlos Delfino had 22 points, Toney Douglas and Patrick Patterson both had 18 points, and Omer Asik had 13 on the night. Jeremy Lin, who left in the third quarter for stitches after a collision with Milwaukee’s Larry Sanders, had eight points. The Rockets were led in rebounding by Omer Asik with eight, and both Marcus Morris and Chandler Parsons had seven rebounds. With the mid-point of the season quickly approaching, Milwaukee looks to get back in the division hunt with a game at the Indiana Pacers Saturday night.